HELENA — The state Land Board, undeterred by anti-mining protesters who disrupted the board’s Helena meeting for 45 minutes until they were arrested, voted 3-2 Thursday to approve leasing 570 million tons of state-owned coal for development of a mine in southeastern Montana’s Otter Creek Valley. The vote by the five-member Land Board approved an $85.8 million up-front bid on the coal by Arch Coal Inc., giving the St. Louis-based mining giant a 10-year window to develop a mine in the pristine valley 150 miles east of Billings. Gov. Brian Schweitzer, who voted for leasing the coal, extolled the long-term economic benefits of a new coal mine in the valley, saying it would bring $5 billion in tax revenue and royalties over the life of a mine and approximately $250 million a year once the mine is operating. If a mine is developed, it would be operating no sooner than five to seven years from now. State Auditor Monica Lindeen and Secretary of State Linda McCulloch joined Schweitzer in accepting the bid submitted Tuesday by a subsidiary of Arch Coal. Attorney General Steve Bullock and state Superintendent of Public Instruction Denise Juneau voted against the lease. All five board members are Democrats. Juneau has opposed leasing the coal from the beginning, saying it’s not in the best long-term interest of the state; Bullock has opposed it since the board voted in February to lower the minimum bid price. He said the state is not getting the maximum value for its resources. The vote came after five protesters disrupted the meeting by chanting “Hands off Otter Creek — you’re not listening!” as McCulloch made a motion to vote to approve the lease. The protesters, who had been sitting in the front row of chairs in the packed meeting room, stood and then linked arms as they sat on the floor, chanting, about 20 feet from the board members. Schweitzer recessed the meeting and Helena Police officers ordered the room cleared, as they waited for other officers to arrive and assist with arresting the protesters. About 45 minutes later, police had handcuffed and arrested the protesters and taken them to the Lewis and Clark County jail to book them on misdemeanor charges of disorderly conduct. Arrested were Shelby Cunliffe, 24; Max Granger, 23; Genevieve Schroeder, 21; Mary Rosette, 21; and Michael Phelps, 29, all of Missoula, who said they were associated with Northern Rockies Rising Tide. The governor and other Land Board members then filed back into the room, reconvened the meeting and discussed the lease before eventually voting to approve it. Arch Coal has 30 days to sign and return the lease and pay the $85.8 million bonus bid. Arch was the only coal company to bid on the state’s Otter Creek coal by the Tuesday deadline, offering 15 cents a ton as a bonus bid, to give it a 10-year right to mine the coal. If the mine is developed, Arch also would pay royalties to the state on the state coal and severance taxes on any coal that’s mined. The state coal is interspersed with 730 million tons of privately owned coal, which Arch leased last November for 10 cents a ton. More than two dozen people came to Helena to speak in favor of the lease, including labor leaders, school superintendents from southeast Montana, area ranchers, economic-development officials and even some advocates for the disabled, who said the $86 million from the bonus bid could help the state avoid pending spending cuts that have been proposed to help keep the state budget in the black. Most of the supporters cited the local and state economic benefits of a new coal mine, noting that Eastern Montana is in dire need of good-paying jobs and tax revenue that a mine would bring. Opponents, including conservation groups, ranchers and farmers living near Otter Creek and at least a dozen Missoula high school and college students, said a massive coal mine would harm water resources, enable a new railroad in the Tongue River Valley and increase global warming. Beth Kaeding of Bozeman, past president of the Northern Plains Resource Council, said she found it “ironic and cynical” that the same Land Board planned to vote Thursday to protect the North Fork of the Flathead River against mine development, while voting for a new strip mine near Otter Creek. “Why is southeastern Montana our sacrifice zone?” she asked. 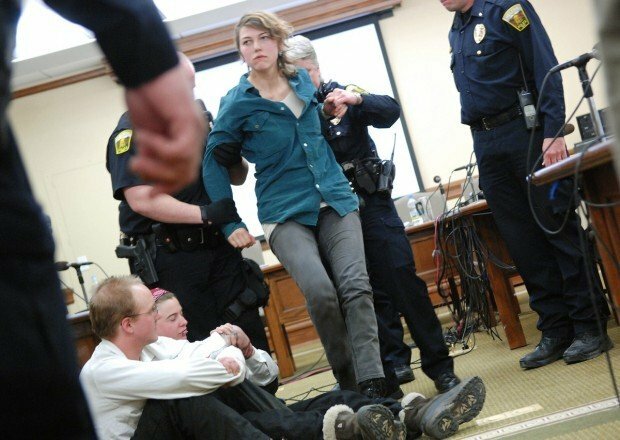 UPDATED 12:55: HELENA - Minutes after anti-mining protesters were arrested and removed by police from the state Land Board's Capitol meeting room, the board voted 3-2 today to approve leasing 570 million tons of state-owned coal for development into a mine in southeastern Montana's Otter Creek Valley. Gov. Brian Schweitzer, who voted for leasing the coal, extolled the long-term economic benefits of a new, massive coal mine in the valley, saying it would bring $5 billion in tax revenue over the life of a mine. "This is not one-time money," he said. "Every time the Legislature comes to town, there will be a pot of $500 million waiting for them." State Auditor Monica Lindeen and Secretary of State Linda McCulloch joined Schweitzer in accepting an $85.8 million "bonus bid" from Arch Coal Inc. of St. Louis to lease the coal for the next 10 years. Attorney General Steve Bullock and state Superintendent of Public Instruction Denise Juneau voted against the lease. Juneau has opposed leasing the coal from the beginning; Bullock has opposed it since the board voted in February to lower the minimum bid price, saying the state is not getting a fair value for its resources. The vote came after five protesters from Missoula disrupted the meeting by chanting "Hands off Otter Creek - you're not listening!" as McCulloch motioned for the vote to approve the lease. The protesters, who had been sitting in the front row of chairs in the packed meeting room, sat down in the room several feet from board members, chanting, and refused to leave. Schweitzer recessed the meeting and Helena Police officers ordered the room cleared, as they waited for other officers to arrive and assist with arresting the protesters. About 40 minutes later, police handcuffed and arrested the protesters for disorderly conduct. The governor and other Land Board members then filed back into the room, reconvened the meeting and discussed the lease before eventually voting on it. Before the protest, the board listened to 90 minutes of testimony from opponents and supporters of the lease. Opponents said the state is getting a poor deal for the coal, and that it's irresponsible for the state to take part in enabling a huge, new coal mine that will contribute to global warming, other air pollution and damaging of water resources in the area. Support came from organized labor, school officials near Otter Creek, Arch Coal, economic-development boosters and some disabled citizens, who testified in favor of the lease because, they said, it would help the state with its short-term budget picture and avoid proposed cuts to human services that would affect the disabled. The lease gives Arch Coal the right to develop the large coal field 150 miles east of Billings, along with its lease of another 730 million tons of privately owned coal that is interspersed with the state coal. Schweitzer and others said the mine wouldn't be developed until five to seven years in the future. INITIAL REPORT: A meeting of the state Land Board was halted this morning after five people stood to protest the state’s plan to lease coal tracts for development in southeastern Montana. 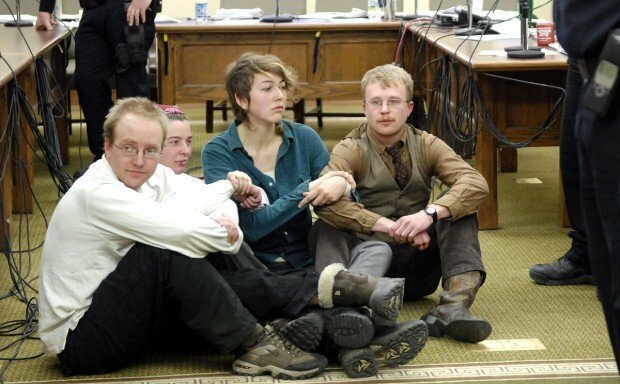 Helena Police officers were called to the state capitol building to arrest the five people, all members of the Northern Rockies Rising Tide, a Missoula-based environmental organization opposing coal development. Gov. Brian Schweitzer, a member of the state Land Board, recessed the meeting and had the room cleared. The five protestors sat down and refused to leave. St. Louis-based mining giant Arch Coal Inc. has offered nearly $86 million to develop the state-owned coal in the Otter Creek valley. Schweitzer said Tuesday hoped the board would approve the deal during today’s meeting. HELENA — Gov. Brian Schweitzer on Monday released $3.5 million in local government grants that had been on hold since late January.